I admit it, I am a One Room Challenge fan, I mean a real fan! I love everything about the process, and I love reading and seeing everything that the designers create. I love feeling a part of a great community and sharing the ups and downs and challenges of interior design that we all go through. If you have arrived at my blog and you are not familiar with the One Room Challenge, it is an interior design program started by Linda Weinstein from “Calling it Home” Interior designers and design lovers redo a room (or space) in 6 weeks and share all the highs and lows of the process! I am in the process of re-doing several rooms in my home as I head towards a major lifestyle change. I plan on selling the home where I raised my two fabulous sons and not only downsizing, but making a major move. I have spoken about this for years with my nearest and dearest, but I am getting closer and closer to making a move to England a reality! Still plenty to do here before that happens, but it certainly adds a sense of excitement to the process!! Last spring I renovated the family bathroom ( you can see that transformation here) and this fall season I am tackling the two bedrooms upstairs. These bedrooms have served as my son’s rooms as they were growing up as well as guestrooms/office/design storage more recently. They have really been just a catch-all for everything including things that my sons still have here at the “old homestead” ……all the moms out there of college-age, or older, sons and daughters know what I am talking about, haha! Truth be told, I think the parents like having those last few ties with the children as much as anyone! Anyway, I will be tackling both rooms, but I will be focusing on the larger one for the One Room Challenge. Transforming this room is going to be a bit bittersweet for me, as the last time I tackled this room I was 8 month’s pregnant with my younger son and I was in serious “Nesting mode”!! The re-do is long overdue since my younger son as been on his own in D.C. for 3 years now, but I still remember the whole process of anticipation, the excitement of choosing the wallpaper with my older son ( he was 5 at the time, but he got to help with the final choices) and working on the room with my dad as we papered and painted over the first weeks of July. It was one of the last rooms that I worked on with my dad. I was his designated “assistant” for almost all the renovations while growing up and now that he has passed on, I remember that camaraderie fondly…. This bedroom will be the main guest room, but the room will not be sitting idle waiting for the guests to arrive!! Right now, it is also the computer room/office desk space, so I will need to find a way to fit that in without making the bed and guest amenities suffer. I would ideally like this room to feel like a special room, where visitors feel well taken care of, not just an afterthought to an office space. I need to accommodate a queen-size bed, at least one nightstand and good lighting, and ideally a comfortable chair, along with my large desk and desk chair. Here are some inspiration pictures that I selected for the general direction of the new room….be sure and tune in next week for the before photos and the new plan and selections for this transformation challenge! I am excited to see all the progress from week to week and I hope that you follow along…all my fellow participants, both featured designers on Wednesdays and the Guest Participants on Thursdays, will be sharing all the highs and lows of creating a new room design in real time!! That’s why they call it a CHALLENGE! What I love about all these images is the great mix of textures and patterns, and at the end of the day…I think they would all be such cheerful and welcoming spaces to come “home” to! Love those inspiration photos and can’t wait to see the before photos next week. Whatever you do I know it will be amazing. Thanks Linda! 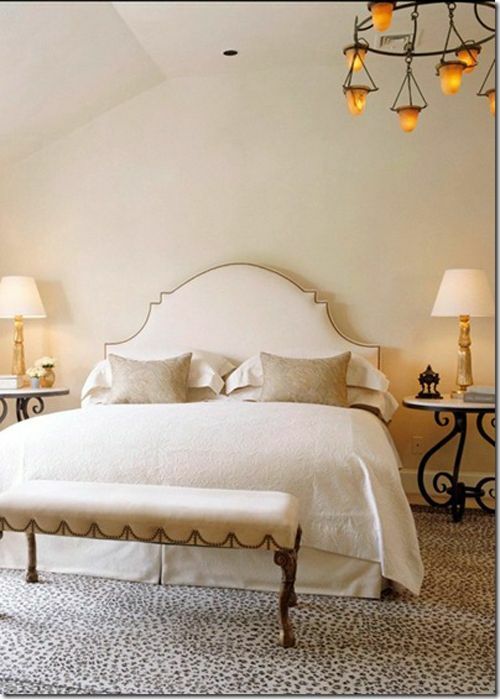 I am really excited to see your featured Master Bedroom as well! It is wonderful to have such great support from the whole ORC community! Love love love! 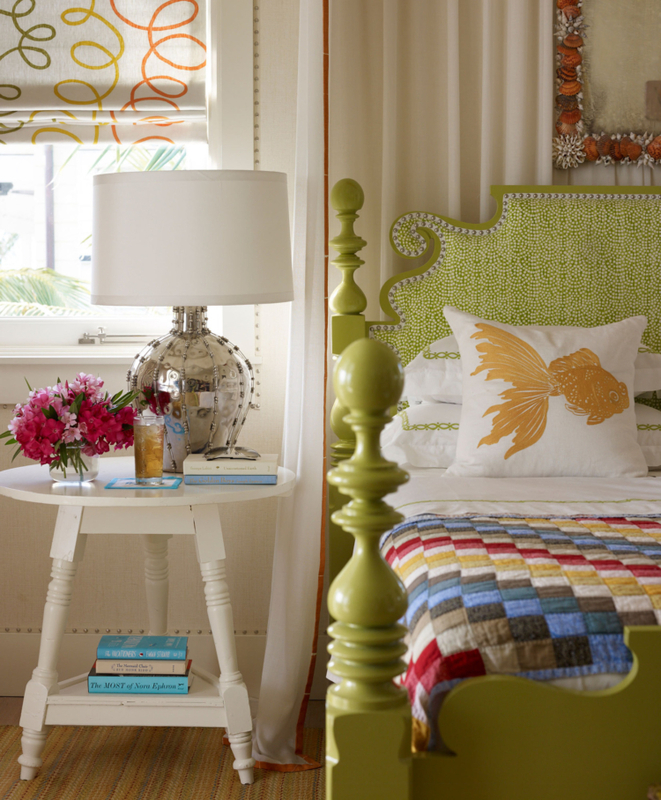 The green bed is darling! And the four poster spindle bed beautiful!! Also….so glad wallpaper coming back! Ive missed it. Gives such atmosphere and depth! Hi Nancy! thanks so much for following!! 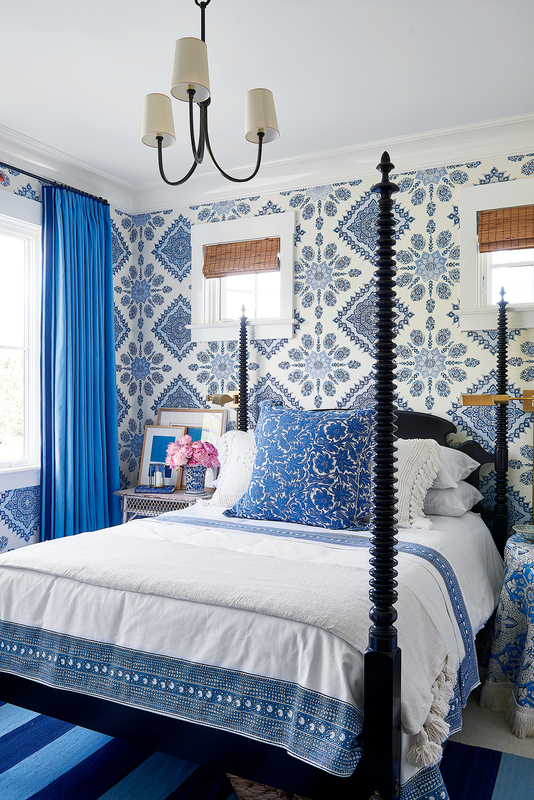 I am really leaning on trying to do that darling bed…and I always think that bedrooms are so much cozier with wallpaper! I love all of the inspiration photos too. Sounds like your guest room will be beautiful at the end of this six weeks. Thanks so much Stacy! I am one of your kindred spirits for sure….love your project this time around and love that beautiful sink you are incorporating! I am also Team Green, so there is that. Looking forward to the whole scary process that is the One Room Challenge! Tackling these rooms with their memories will help put closure of some sort – whatever fits you – so you can move onto your next chapter. I loved the mention of dad’s design assistant and nesting! Beautiful choices as always. I can’t wait to see the process. So, so true, Sue! I keep talking about how its the memories that are important, and I definitely remember the “nesting” urge that weekend, haha…It was hot, too, I remember, but we are all so focused on getting it finished in time and enjoying the progress of getting another room finished and starting the new chapter….that I don’t remember anyone complaining about heat or hard work that weekend! Thank you for following along and commenting…I love all the encouragement of this community! A move across the pond!? That’s so exciting! And how special that you’ve come full circle to redo your sons bedroom as a guest bedroom now that he has flown the nest and is thriving on his own. I’m excited to follow along with this special project! Hi Kelly! Thanks so much for checking in! I am glad you decided to jump in this round, and I thought about the full circle thing myself with your room being for “big boy” Eamon! The “befores” for my son’s room also had a “Americana-Red, White and Blue” palette and I loved the connection as moms of sons that we share! Wow! Looking through your inspiration photos, I have to say #’s 3, 4, and 5 are my favorites, and fortunately Jenny agrees! I love the wallpaper options, but we also find the paneled wall in #5 is a nice way to add texture and interest without being potentially overwhelming or tiresome. That room is also airy and inviting, a big plus for Jenny. 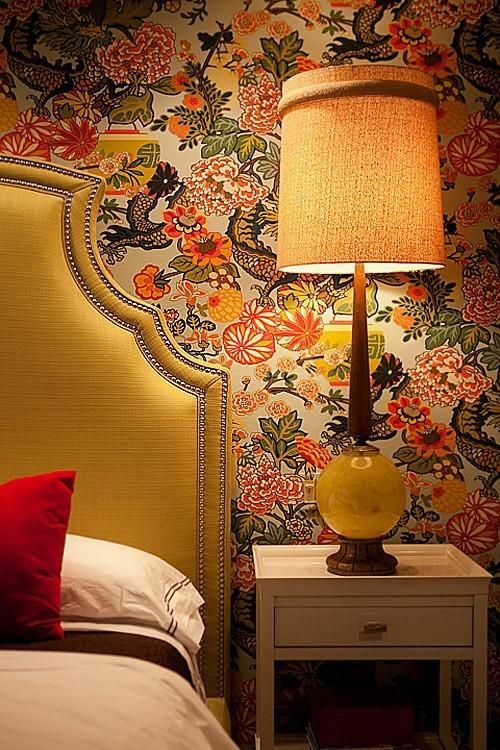 The warm, autumnal colors of #4 are calling to us this time of year, and the lamp is an intriguing piece for the bed stands. 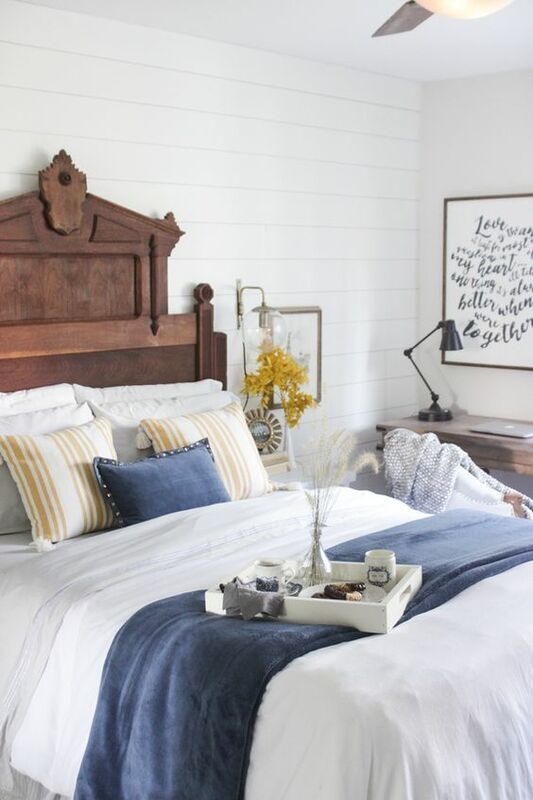 The spindle bed frame of #3 is also quite striking, probably our preferred of the bunch, though we don’t mind an upholstered headboard like in #4. We can’t wait to see what you end up choosing! PS: Is that a birch tree lamp in the last photo? That’s a nice taste of home! Wow, Thanks Alexander! Very much appreciate your take on the inspiration photos!! 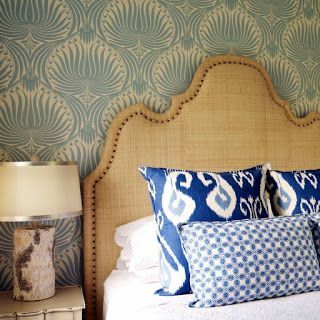 I am struggling to decide on whether or not to wallpaper, as it is so personal and I do have to think of perhaps a less specific design, but as I said to Nancy above, wallpaper is definitely one of the things that I think make a bedroom so warm and inviting. You and Jenny will have to let me know what you think of the plan that I have created once I share that for the ORC! I hope you keep following the progress!